It’s not called the Silly Season for nothing. Christmas – as it’s celebrated in Australia at least – means scorching Summer sun, crowded air-conditioned shopping centres and agonising deliberations about cold salads or hot roast for Christmas dinner. It also means gift shopping, my personal Nightmare Before Christmas. What would it look like to measure such madness? Christmas KPI 1: Gift Purchase Cycle Time. This KPI measures the average number hours you spend gifting someone. It starts when you decide to purchase a gift for someone, and ends when the gift is given (the moment it’s full weight rests in the hands of the giftee). 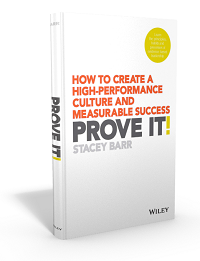 You only have to count the actual time you actively give to the gifting process for that person. Don’t count the elapsed time because you’ll be double counting, since you’re no doubt going to buy gifts for more than one person. Christmas KPI 2: % Time Spent in Queues. A driver of KPI #1. This measure tracks the total hours you spend standing in queues to pay for the Buzz Lightyear and Monster High dolls and dozens of other gifts in the stores that everyone else decided to shop in at the exact same time as you, expressed as a percentage of the total hours you spend shopping. You can opt to include in the total time how long it took you to negotiate traffic and find a car park, and you could even add this to the total queue time too (I mean, who can find a car park at a shopping centre at Christmas time without driving in circles and hunting down shoppers lugging toy-laden shopping bags in desperate search of their cars?). Christmas KPI 3: # Hours Gift Hunt Rework. Another driver of KPI #1 and companion to KPI #2. This measure tracks how much time you have to spend searching for Zoobles (second choice for the intended gift) because all the Sing-A-Ma-Jigs (first choice for the intended gift) sold out. It also includes the time you spend returning the Harry Potter Hogwarts LEGGO game after discovering someone else has already bought that for little Johnny, plus the time to find something else that little Johnny might want just as desperately. Christmas KPI 4: Gift Comprehensiveness Rate. Did you forget anyone? This KPI will help you avoid the embarrassing possibility of having a gift for almost but not quite everyone at the family Christmas get-togethers by tracking the percentage of your targeted giftees for whom you have already purchased and wrapped an appropriate gift. 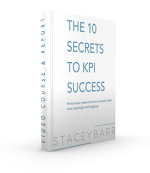 Keep this KPI close to your Santa List. But just remember: garbage in equals garbage out so don’t blame the KPI if you forgot to add someone to your Santa List in the first place. Christmas KPI 5: Average Giftee Satisfaction. This is probably the ultimate success indicator: how happy the recipients of your gifts are with your gifts. Don’t try to use a survey form for this one because the risk of it getting lost amidst all the torn and strewn gift-wrapping is very high. You’ll need to gauge satisfaction visually, and I’d suggest creating a carefully weighted index comprising a measure of the percentage of eye-widening that occurs at the moment of unwrapping, a measure of the number of seconds from when the gift is unwrapped to when it is put down in favour of unwrapping another gift or playing with one already unwrapped, and a measure of whether or not the giftee asks for a copy of the purchase receipt and refund and exchange policy of the store where you bought it. 1) I don’t believe in weighted indices. That was just a joke. 2) I’m not actually a Scrooge – I don’t hate Christmas but I really don’t like the commercialism and queues. 3) It won’t be worth your time to measure any of these KPIs. Just deal with the madness and try and enjoy the holiday season despite it. 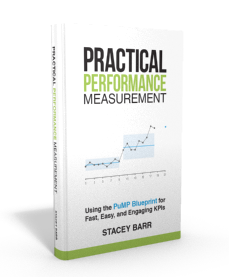 Forget about KPIs for a little while, and just have a great holiday season!